Take a look through any vintage crochet magazine, and there will be a number of collar patterns. There was a time in fashion history when everyone added a white lace collar to accessorize their shirts and dresses. Although the practice isn't common today, a crochet collar is a great way to add a pop of style to any outfit. With a nod to the vintage and the feminine, a cute collar can be quirky, sweet, or dressy. These crochet collar patterns showcase the different design options for this unique accessory. This cute collar is classy without being frilly or lacy. It is a classic design, known as Peter Pan, that works with many different styles of clothing. This pattern is made with basic stitches (mostly double crochet) that are easy to work up. The collar closes up with a simple button. Here is another variation of the Peter Pan collar. This one is lacier crochet for an added feminine touch, enhanced by the shell stitches that rim the bottom of the accessory. This one also closes with a simple button or jewel. The crochet pattern is available for download in English as well as Spanish. This crochet collar is extra lacy thanks to a design made up mostly of crochet chains. The strategic placement of the chains and stitches creates a mesh lace that has a feminine, soft appeal. The crochet collar closes with a simple ribbon tie. The Georgette Collar is really retro and fun. It'll definitely take the wearer back in time to those carefree cashmere sweater days. Yet the look is also fresh, wearable, and up-to-date. This simple free crochet pattern is the perfect design for beginners who are looking to crochet their first collar. The designer has shown different ways to work the same design by changing colors and adding different details (such as flowers instead of circles on the ends of the ties). It closes easily thanks to that tie. No additional sewing skills are necessary. This is a Japanese pattern for a crochet collar. It is quite lacy and floral and is wider than many of the typical vintage-inspired American collar patterns. This crochet pattern is written in Japanese, but it comes with a symbol chart that for those to use if they don't know the language. Worked in thread, this crochet collar from can serve double duty as a crochet necklace. This makes the pattern more versatile and allows people to easily accessorize with it in a modern way. Although this one looks very detailed, it is made with basic crochet stitches and is a great example of thread crochet jewelry. The opposite of a thread crochet necklace collar is a thick cowl-like ribbed collar. This one is made with one skein of a rich metallic yarn. It is a perfect cold-weather accessory. Find this crochet pattern in the ebook called Single-Skein Accessories, which also includes patterns for additional neckwear designs. Use thread crochet to create a very detailed crochet lace collar and matching fingerless mitts. These vintage-inspired patterns are perfect as bridal crochet. Work them in a different color for a more contemporary design. These coordinated crochet patterns are worked primarily with basic stitches, although there are some clusters for texture. The instructions include detailed photo tutorials. 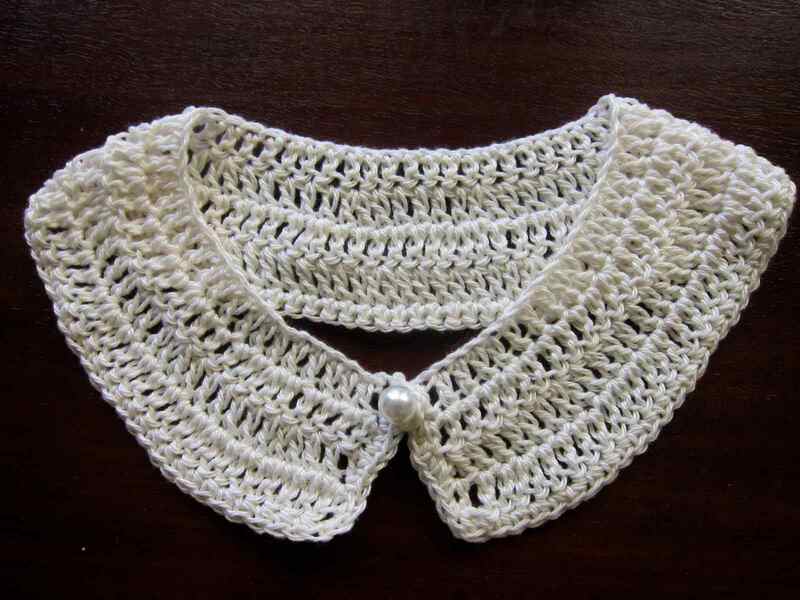 This is a Peter Pan style of crochet collar that comes with instructions to easily adapt it to any size including making it a children's collar. A children's collar is great because you can use it to dress up an outfit for photos or special events, but take it off if it's bothering an active child. 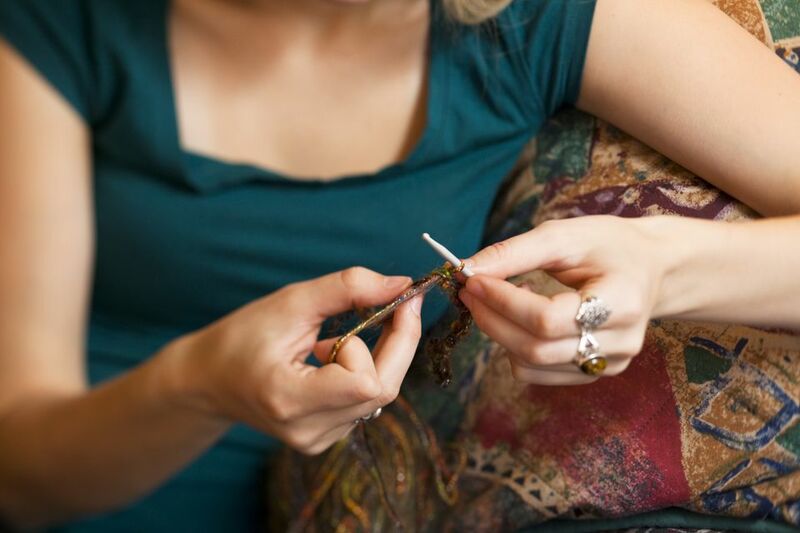 This pattern can be worked with bamboo yarn for a soft touch or any kind of wool, making it a cozy, plush accessory. This crochet accessory set was inspired by Masterpiece Theater's costume dramas. It can be worn as part of a costume, but it's also a great way to add drama and flair to an every day outfit. The pattern uses hyperbolic crochet to create the exaggerated juggles.